A retractor, made by Key-Bak in the USA, with an attached split metal key ring, extends up to 4 feet on a rugged Kevlar cord. 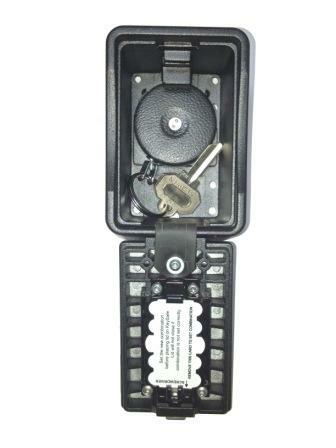 Mount this custom lock box next to a locked door or gate and instantly have controlled access to that door or gate. This key safe allows our customers to feel confident that their keys or access cards are securely attached to the lock box and can not be accessed or duplicated without their knowledge - particularly when the optional tamper proof key ring is used. 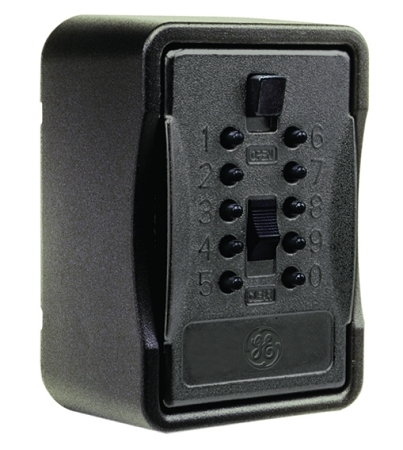 The standard Key Safe Pro / Big Box features include a heavy duty mechanical keypad -- no batteries needed -- which opens easily using a numeric combination you choose yourself. The combination can be easily changed whenever necessary. The door of the lock box is attached with a flexible "hinge" enabling one handed operation and the raised keypad design permits opening the unit in near dark conditions unlike dial combination types. The Key Safe body is made with thick rustproof metal walls and an interlocking face-plate for a high degree of security. Surface mount style; may be installed to walls or other surfaces using your own screws or bolts. Exterior size 4-7/8"h 3-1/2"w 2-1/2"d.
Interior size 3-5/8"h x 2-3/8"w x 1"d.
Need a lot? Call for a quote. Includes a flexible black rubber cover that fits snugly but allows easy access.